When it comes to traditional foods, regional and personal variations can be a rhetorical minefield. What constitutes “authentic” or “proper,” and whether that matters, is an all-too-familiar refrain. Go to Emiglia-Romagna and try to get a pair of neighbors to agree on what constitutes a traditional Ragù alla Bolognese. It’s both rare and somewhat refreshing to encounter a specific dish about which the prevailing attitude seems to be that there are a million different ways to prepare it, and every version is loved by somebody. 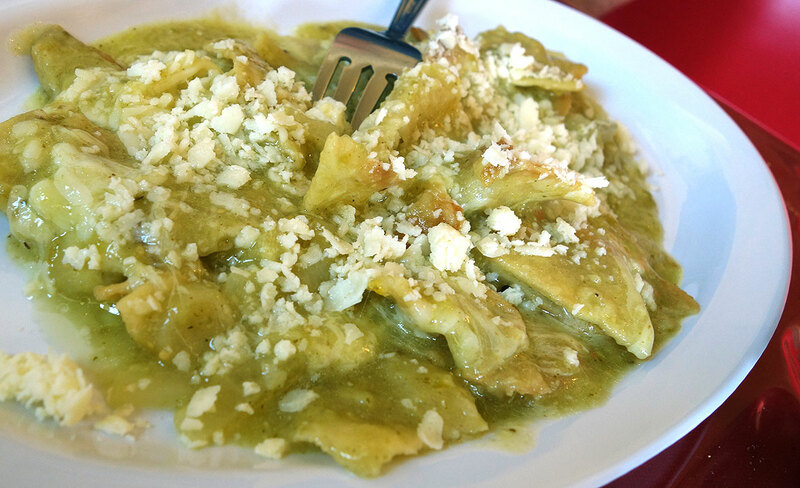 So I certainly won’t be so bold as to claim that the chilaquiles from Horseshoe Restaurant are the most authentic in Phoenix, but they are the most authentic to Rosa Avitia, and they are the most beloved to me. I was first introduced to Horseshoe Restaurant by my friend, Mike Todd, a fellow food nerd who’s similarly fond of exploring the lesser-covered nooks of the city in search of something unusual and special. It was an errand around the corner and the siren’s call of agua de cebada (similar to horchata, but made with barley) that led Mike to El Horseshoe, and he discovered their unusually good chilaquiles along the way. Horseshoe is easy to miss, a nondescript building in an industrial neighborhood, crouched on a dusty stretch of Buckeye just west of downtown, next to a telephone pole with a faded sign that reads “Local Calls 25₵,” though the phone was probably removed a decade ago. It has a devoted following, though, and hosts a steady stream of customers through breakfast and lunch, who park their trucks in the lot next door and stop for chuletas or a bowl of birria de chivo in between jobs. Inside, it’s spartan, impeccably clean, and warm in the summertime; the ceiling fans jostle when a semi roars by the front door (which happens a lot), and the customers eat and trade jokes and maybe watch a little soccer on TV. One needn’t know Spanish, but you won’t hear much else from the staff, the patrons, or the television. Sometimes, though, one of the more gregarious regulars (and there are a few) might jump in with a translation or a suggestion. The owner and head cook, Rosa Avitia, hails from Ciudad Obregón, Sonora’s second-largest city, located about 325 miles from the border. She’s been running Horseshoe Restaurant for an astounding two decades, and she offers the kind of hearty Sonoran fare that touches on corner taqueria standards, but takes a more soulful, home-cooked bent. Eggs atop all manner of meat is the primary order of business in the morning, giving way to a roster of griddled meats, chile-spiked stews, and simple soups as the day progresses. The food is without the slightest hint of pretension, prepared in workmanlike fashion for an audience of workmen, honest and delicious, simple and satisfying. As such, it should come as no surprise that the chilaquiles — the very definition of soulful, home-cooked food — are exceptional. Chilaquiles have been around for hundreds, perhaps thousands of years, and the variations that have been brought to them are endless, but at their heart is the simple interaction of tortillas and salsa; two cornerstones of Mexican cuisine, not merely cohabitating on the plate but married ’til death do them part, the former simmered in the latter until they become an inseparable whole. Whatever else may constitute “real” chilaquiles, rare and ancient regional variants aside, this much is surely beyond dispute: that the salsa softens crisped tortillas, which also retain some degree of their original texture. This baseline can then be enhanced by an infinite variety of additions and enhancements, but that fusion and balance of salsa and tortilla is the key, and in my estimation, Rosa strikes the bullseye. To Rosa, chilaquiles is a simple dish, not to be overwrought or fancied up. She offers two versions — red and green — and both are no more than tortillas, salsa, and a little cheese. It starts not with chips, but with day-old raw tortillas, which crisp more easily and hold their texture better having dried out slightly. Rosa tears them into pieces by hand and tosses them in a pan with hot oil, cooking them for a few minutes while turning them occasionally until they are warmed through and crisped around the edges. She pours off the excess oil, then adds fresh house-made salsa, tomato (red) or tomatillo (green). The salsa and chips are cooked fairly hot, moisture either being absorbed or bubbling away until the chips have softened and the salsa has turned thick, at which point Rosa adds a handful of shredded mozzarella cheese (a little personal touch — she prefers mozzarella), which quickly melts into the sauce. She plates the chilaquiles, and gives them nothing more than a light dusting of crumbled queso cotija before sending them out to the dining room. The beauty of these chilaquiles lies in how little is done to detract from that perfect marriage of salsa and tortillas. There’s a magical point where the tortillas have softened a little bit but are still firm, taking on a hearty, almost meaty consistency, while their edges retain just a little bit of fried crispness. This is precisely where Rosa’s chilaquiles lie. And where other chilaquiles are often a pile of tortilla chips swimming in salsa, or a lifeless, mushy mess, or buried under so many toppings that they’re little more than soggy nachos, Rosa threads that textural needle and then leaves them the hell alone. The red chilaquiles have a little natural tomato sweetness and a background hum of dry chile, while the green pack the tomatillo’s tart punch and a sneaky fresh chile heat that sometimes doesn’t make itself known until you’re about halfway through. Both are rich with an almost creamy quality, perked up by the cotija’s salty sharpness and perhaps a little splash of fresh salsa which is usually served alongside. And though an optional side of rice and beans can bulk up the plate, triple your starches, and make the meal even more stereotypically Sonoran, I’m of the opinion that a fried egg or two, complete with gooey yolk, is not only the perfect pairing but the only thing I’d dare add. Rosa’s opinion is that chilaquiles are best enjoyed simply, and though there are those who will disagree, you will not find me among them. Horseshoe Restaurant is at 2140 W. Buckeye Road, situated on a dusty stretch between downtown and the I-17. The phone number is 602.251.3135, but depending on who’s working the tables, that might not be much use to you if you don’t speak Spanish (they’re open from 7:00 AM to 4:00 PM every day, if that’s what you’re wondering). El Horseshoe is one of the rare establishments that offers a truly dry, jerky-like machaca, which you’ll probably enjoy if the descriptor “jerky-like” makes you think you might. And they also make a mighty tasty puerco de chile colorado, meaty soups like birria de chivo and caldo de res (goat and beef, respectively), and the accompanying tortillas are always thick, steaming, and freshly griddled. This entry was tagged chilaquiles, Mexican, salsa. Bookmark the permalink.